We're not going to tell you that becoming a game developer is easy. But it's certainly easier when you have the right tools - like this 10-course bundle. And when you can pay what you want for it? The choice is even easier. Pay what you want for the 2017 Master Game Developer Bundle at Escapist Deals. Here's how it works. 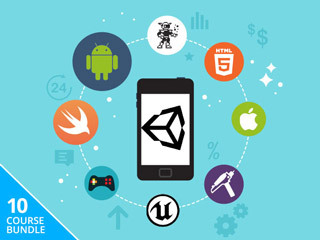 If you want to pay below the current average price, you'll get the Construct 2 and Java courses (worth over $160) and learn some HTML5 and even make your own Flappy Bird clone. But if you're ready to go all in, just beat the average price and all 10 courses worth over $1,000 are yours. You'll get a chance to master it all, from designing levels and game art to making iOS and tvOS games alike. It's a great deal whether you're looking for a lucrative new career or just want to learn some basics and make game dev your side hustle. Choose what you need and then pay what you want for the 2017 Master Game Developer Bundle at Escapist Deals.